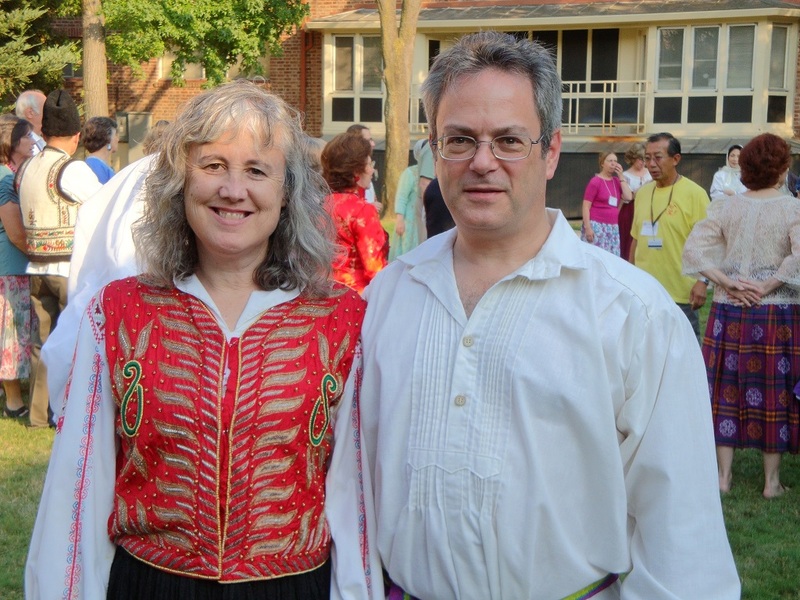 For the last ten years or so, my husband and I have been folk dancing. We were pulled into it by our younger son, who started folk dancing in high school. For those who have never done it, folk dancing is international, both in content and participation. In the years we’ve been dancing, we’ve done dances from Israel, Poland, France, Spain, Mexico, India, Japan, Romania, Italy, England, Scotland, Portugal, Croatia, Bulgaria, the US, and probably several others I’ve forgotten. They’re mostly choreographed, that is, set steps to set pieces of music. But sometimes we’ll do some freestyle swing or tango or waltz. We even once taught an American 4-wall polka dance in the Netherlands. Or rather, my hubby taught while I helped demonstrate the steps. Most of what our particular Friday night group does is couple dances. Those dances include the raucous American Maple Leaf Rag and the tender Israeli Metzuit Acharet. 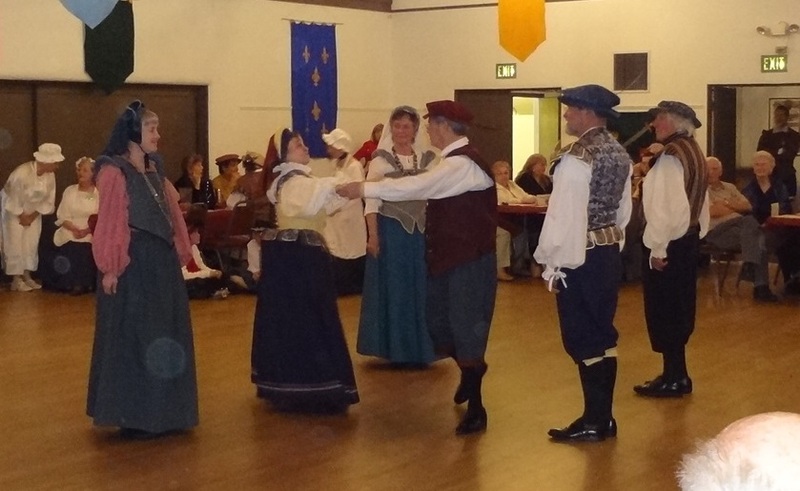 We also do set dances for three or four or five couples, or “as many as will” English Country dances and Contras. 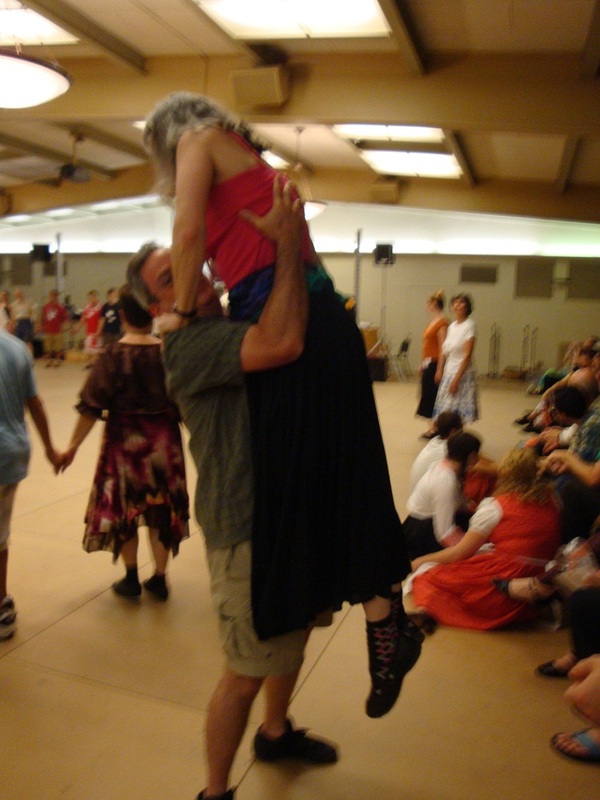 We do fit in the occasional non-partner dance like the Romanian Te Aven Baxtale (video here). If you’re looking for me in the video, I’m the one with the gray top and white skirt and shoes. One recent Friday night, it occurred to me that there are some rules of dance that seem to apply to life as well. Between dances, I started recording the rules that came to me. When a circle comes up in a dance, you don’t have to look around left and right to find the hands of the people next to you. Just throw out your hands and the other dancers will be there to grab. By the same token, when it’s time to join up with others and do something together, trust that they will bring you in and make you part of the group. Some of the couple dances we do are quite lively. They’re generally lead-follow dances, and sometimes the lead will send the follow out in a fast spin. The follow has to trust that the lead won’t send them into outer space, that they will grab hold and bring them close again. In life, sometimes your spouse, or partner, or a friend will suggest you take a chance, something that’s a stretch, but good for you. And they’re going to back you up. Trust that they’ll catch you if you need it. I’ve always thought the two-step was the most oddly named dance step. Because it’s really three steps, a one-two-three in a slow-quick-slow pattern. Life can be like that. Labels aren’t always accurate. They’re not always meant to be taken literally. Sometimes they’re just a name to call something, and it’s best not to get too hung up in what you think the thing should really be called. I’ll do this often when I’m learning a new dance, or decide to join in a simple line dance that I’ve never done before. I just keep an eye on someone a couple places up from me, someone who knows how to do the dance, and I imitate what their feet are doing. In life, there’s always someone to follow. Some folks might be flailing around as much as you are, and if you follow them, you could step on someone’s toes. Instead, look for the one who knows what they’re doing and follow in their footsteps. This is something I learned first hand when I broke a bone in my ankle recently. I couldn’t dance. I certainly couldn’t skip. But I could walk a little, and I could certainly stand and sway. In life, you’ll always have the ability to do something to take part in what’s going on. It might not be as fancy as the next person, but it’s your contribution, and no one else can do it like you. This is kind of an inside joke amongst folk dancers. A dance will come up on the program that we were once taught, but we haven’t done in quite a while. So we turn on the music, and see if our bodies can remember the steps. Sometimes it does work–we hear the music and the steps just come. Other times we fumble and laugh and decide to do the dance another night after checking the notes. But just as in dance, in life it’s good sometimes to just plunge in and see if you can figure it out as you go along. If it flops, at least you made the effort. But maybe you’ll hear the music and know just what to do. This is another inside joke of folk dance. Sometimes we’ll forget some part of the dance, so we substitute another step that seems to fit. We justify it by saying, “Well, in some village, somewhere, they might have done it this way.” So if you do something that’s not quite in step with the way everyone else is doing it, that’s just your variation. That’s the way you learned it in your village. “Number one couple” is a term used in set dances. The number one couple is usually the one that is the active couple, and is doing all the really fun steps of the set. But what’s cool about set dances is that the number one couple switches around to everyone. So we all get a chance to do those fun, active steps. It can be the same in life–someday, somehow, you will get your chance to be in the limelight. You will get the chance to show off your fancy steps. And everyone will be watching your dance. This entry was posted in Strongly Held Beliefs, Unusual Hobbies and tagged awakening, clean burn, folk dance, international folk dance, karen sandler, rebellion, stockton folk dance camp, TANKBORN. Bookmark the permalink. Lovely post, Karen. Inspiring even!